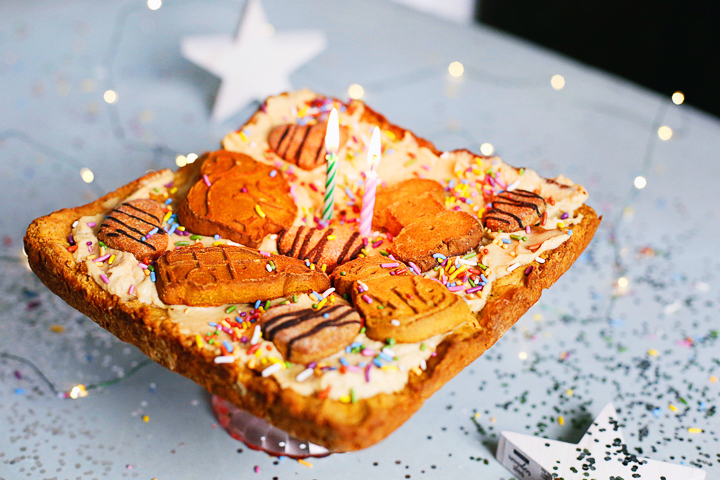 How To Make A Dog Friendly Birthday Cake — Welcome to Fitty Foodlicious! Dogs are special being’s that should be celebrated every day! Why not show them your love by making them a dog-friendly birthday cake that’s sure to please all puppy pallets. 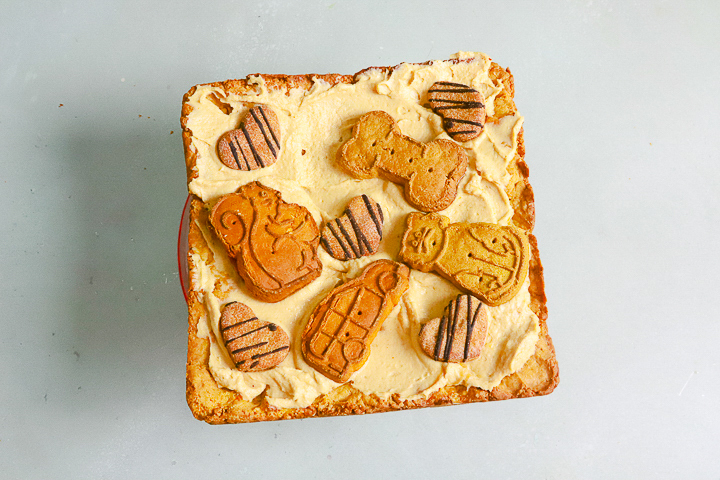 My dog-friendly cake recipe is made with gluten-free flour, organic carrots, organic peanut butter, and even has a tasty frosting on top. Top it off with dog treats and birthday candles and give your puppy the best birthday ever! If you are lucky enough to have dogs in your life then you know how joyous it is to celebrate their birthday! Lincoln turned two-years-old last weekend and we had the best celebration! We started the day at the trail and he and Roxy spent two hours running, exploring the river, and enjoying all of the vitamin-d. After our trail adventures, we went to our favorite Starbucks and got Lincoln and Roxy a puppacchino. If you don’t know what that is, it’s a cup full of whipped cream. Going through the drive through was the highlight of the day! The crew at Starbucks sang happy birthday to Lincoln and wrote happy birthday on his cup with paw prints. Yes, I totally saved the cup. He sang right along with them and so did Roxy. It was the most adorable thing I’ve ever seen and I’m happy to report I got it all on film. Then, we came home and gave Lincoln his new dog toys and treats. I picked up a flamingo, tuff shark toy, and rawhide chews from Petco. 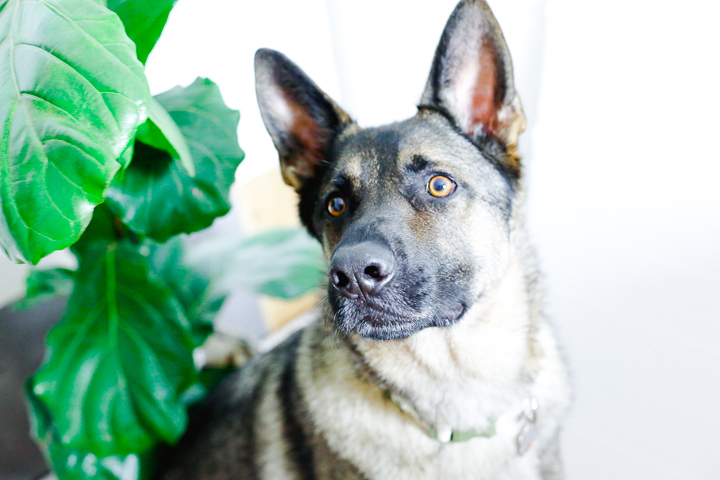 Although, true to German Shepherd form, he takes the raw hide chews and strategically buries them all over the yard. It’s hilarious to watch because he’ll never put the raw hides in the same place. They have to be in different places. Boy dogs have a lot of similarities to each other and I find myself thinking of Harley often while I observe how Lincoln acts. One does not replace the other, only adds to it. We wrapped the day by making a Lincoln a birthday cake! Dog-friendly birthday cakes are super easy and if you haven’t tried it, I highly suggest you do! I created this recipe from years ago when I made Roxy and Harley a birthday cake for their birthdays. That was before I was a recipe developer and I modified today’s version, but it’s basically the same one I came up with before. This cake is also human-grade friendly too! This dog-friendly birthday cake is a lot of fun to make and have your pup join in the fun while baking it. All you need are a few simple ingredients and you will have a dog-friendly cake in less than an hour. I used gluten-free flour because Lincoln is on a grain-free diet and also used organic, sugar-free peanut butter and eggs for the base. I also added in two cups of shredded carrots and some vanilla extract (you could use carob extract as well). For the frosting I whipped together peanut butter and organic whole-milk yogurt, but you could sub in Greek yogurt as well. Making a dog-friendly cake is one of the easiest things to do and it’s a lot of fun! If you make this recipe, be sure to Pin it on Pinterest to always have access to it. And don’t forget to tag me in your posts on Instagram @fittyfoodlicious using the hashtag #fittyfoodlicious I love seeing my recipes in your kitchen. Do you have dogs in your life? Do you celebrate their birthday’s every year? I think a dogs life should be celebrated every single day! 1-cup organic peanut butter and 1-cup organic whole milk yogurt (These are for the frosting, please see frosting instructions at the end of this recipe. In a medium mixing bowl add the egg, peanut butter, melted coconut oil, honey, and vanilla extract and mix gently until combined. Add in the flour and shredded carrots and continue to mix well until combined. Pour the cake batter into a greased cake tin and bake at 350-degrees for 45-60 minutes until the cake is cooked through. You can test this by placing a toothpick into the center of the cake and if it comes out clear, the cake is done. The cake uses the freshest ingredients possible so make sure your pup (s) consume it right away! It should keep in a glass airtight container for two days.